“What’s that jar on the shelf?” I’ve been asked. Fermenting happily and regularly on my shelf is a cultured little friend of mine, milk kefir. (I call him Mr. Scoby). And as you’ll see it’s a tough question to answer in just a sentence or two, hence the blog post! 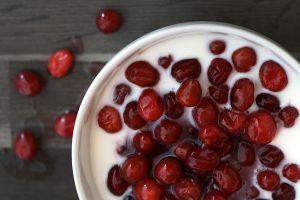 I’ve been doing some reading on kefir, and it’s a little confusing trying to navigate all the info online, as well as the varying instructions on different sites, so I’ve boiled it down to what I think is the coolest and most essential info and tried to make my instructions as straight-forward as possible. You can find heaps more stuff online about milk kefir. My 2 kefir jars, with their muslin cloth covers. Kefir is a fermented milk drink, traditionally made using cow’s or goat’s milk. It’s similar to a yoghurt drink, and if made correctly should taste wonderfully smooth and deliciously sour. The name comes from the Turkish word “keif” meaning “good feeling”. Kefir is one of the most probiotic rich foods on the planet, and for centuries it has been used in European and Asian folk medicine due to the wide variety of conditions it has been reported to cure. It’s commonly used to aid digestion, boost immunity, kill candida and balance the gut microflora promoting gut health. Kefir is a rich source of vitamins A, B2, B12, D, K, calcium, magnesium, phosphorus, and typtophan. You can make it at home, by simply adding kefir “grains” or “scoby” to milk, and allowing it to ferment overnight. So simple and cheap! You can drink the fermented milk (minus the scoby) it at this stage, or put it in a second jar and allow it to “double ferment”, this time fermenting without the scoby/grains. This is said to increase the probiotic content and I find it makes it even smoother and tastier! Just like magic, the micro-organisms in the kefir scoby/grains feed off the lactose (sugar) in the milk, turning it into gut-friendly lactic acid rich kefir. It’s alive, so as long as you keep feeding your scoby with milk, it will live forever and keep growing bigger so you can spread the goodness by splitting it in two and giving some away from time to time! You can drink your kefir on its own (yummy! ), drizzled over fruit or cereal, or use it to make salad or fish dressings (mix with herbs, salt and pepper). If you don’t like the taste of it, try blitzing it with raw cacao, strawberries and banana for a tangy-sweet choccie milkshake. Soak porridge oats overnight in Kefir in the fridge with fruit and nuts. Use instead of buttermilk when making scones or bread. With a little imagination the options are endless! 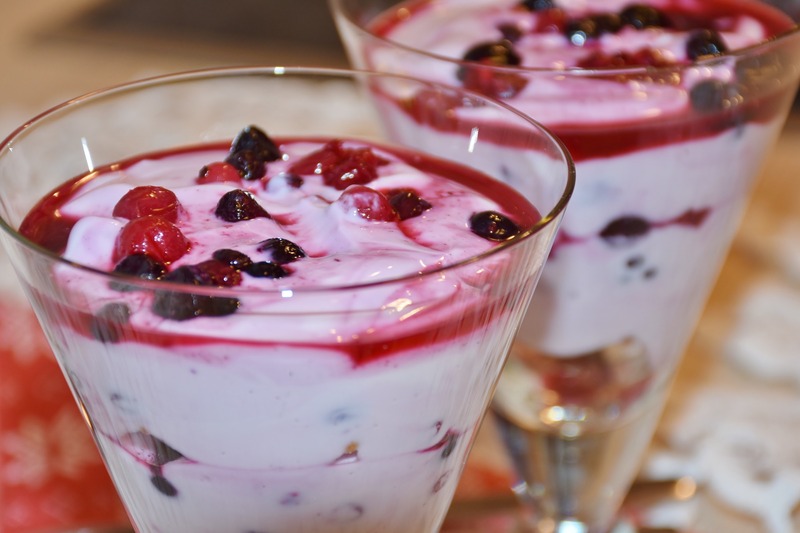 Cranberries with kefir for a tarty taste! 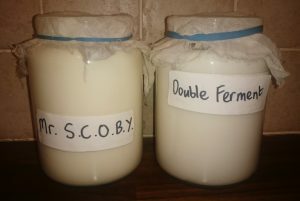 You’ll need: Whole organic milk, kefir grains/scoby, 2 squares of muslin cloth, 2 rubber bands and 2 jars – one for the scoby to ferment the fresh milk (I label this SCOBY) and another for the second ferment (I label this DOUBLE FERMENT) I use clean Yankee candle jars for my ferments. Also a Kilner bottle to pour your double ferment into and store in the fridge. SCOBY Jar: Pour milk over the SCOBY (kefir grains). Cover with muslin. Take SCOBY out of jar with plastic spoon, and tip the “first ferment” into your second jar – labelled DOUBLE FERMENT. Put SCOBY back into the same SCOBY jar, top up with milk, cover with muslin again and leave out. Leave the DOUBLE FERMENT jar out for 12-24 hours until it gets thick, it might separate into curds & whey. That’s your finished “kefir”! Your next batch of “first ferment” should also be ready now to swap over….and so the perpetual process continues! Transfer you finished “kefir” from the Double Ferment jar into a Kilner bottle using a funnel and put in the fridge (don’t seal the lid closed). You can shake if it’s a bit lumpy. It’ll keep for a several days in the fridge. When you want to slow it down/take a break, you can refrigerate it in the jar covered with muslin for 5-6 days then take it out, allow it to ferment a bit more if necessary, and do the usual swap when it’s ready. Don’t touch any metal off your SCOBY grain, it can damage the cultures! I use only organic while-fat milk, as there’s no risk of any trace antibiotics in organic milk which could harm the scoby. I also use organic raw milk from time to time and find that my scoby seems to love it and it grows faster and ferments better for a while afterwards, interestingly even after switching back to pasteurised organic milk. Don’t ever rinse or clean the scoby with water. Just keep topping it up with fresh milk and it’ll do just fine. I clean my jars about once or twice a week only, no need to do it every time. I leave the scoby sitting on the plastic spoon while I do this – it’s not out for long so it’s fine. When it starts to get bigger (a heaped teaspoon sized) you can divide it in half with a plastic knife and give to a friend, along with a link to this blog post! My SCOBY has about 25 offspring in the Carlow area so far, and still spreading! 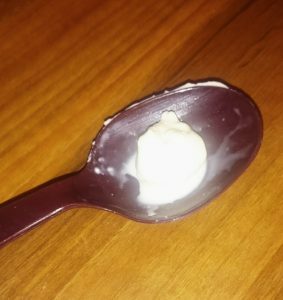 To get yourself some kefir grains for free try searching for a “starter culture sharing” group on Facebook, there may be someone in your area with one or someone willing to post to you. Or you can purchase them for about €5 on ad websites such as Done Deal and Gumtree. Be careful that you purchase live grains and not freeze-dried kefir starter powder. They are different. So this was another lifestyle post, nothing really to do with bridal makeup artistry, weddings or photoshoots! But I just love sharing what I’ve learned, which is why I named my blog “More than Makeup”. It all ties in though folks, for the best skin and good moods, we need to look after our insides too!